Evan Weinger had to blaze a new trail this season. After three seasons in Portland, he was dealt to Brandon after playing just one game for the Winterhawks during the 2017-18 Western Hockey League (WHL) season. The shift to the plains from the coast agreed with the 1997 birth year from El Segundo, who put up a career-best 57 points and 31 goals and was a plus player on a playoff team. He added another seven points in 11 playoff games. The 64 total points nearly doubled his previous high of 38, and his 31 regular-season goals came on a ridiculously low 153 shots (a shooting percentage of .202). He also scored five short-handed goals. Weinger attributed the shooting success to a couple of things. An exceptional skater with good size (6 feet, 200 pounds), the free agent was snapped up by the San Jose Sharks’ top affiliate, signing an AHL deal with the Barracuda in March. It’s rare to have such a concentration of players from California on one junior team, but that’s what Wenatchee of the British Columbia Hockey League (BCHL) has – nine in all, and five made our All-California team. The Wild contended for an RBC Cup (awarded to Canada’s Junior A champion) this month in large part due to its Golden State presence. Even more remarkable, six of the seven defensemen on the club’s playoff roster are from California. Garrett Nieto, Janesville (NAHL) – In his third season of junior, the 1998 put together his best season, posting a 21-5-2 regular-season record with a 2.00 GAA and a .929 save percentage and three shutouts. The Union College commit, who played for the Anaheim Jr. Ducks and L.A. Jr. Kings, was even better in six playoff games, going 4-2 with 1.68 and .940 numbers and two more shutouts. Evan Plotnik, Melfort (SJHL) – The 1997 matched his win total from his first two years of junior with a 25-10-2 record and two shutouts to go with a 2.62 GAA and .910 save percentage. American International College took note, committing the former San Diego Jr. Gull. Dustin Wolf, Everett (WHL) – The former Jr. Kings goalie made a big impression in his first season of major junior, fashioning a 13-6-0 record with a 2.25 GAA and a .928 save percentage. A 2001, he is eligible for the 2019 NHL Draft. Slava Demin, Wenatchee (BCHL) – The Denver recruit (a 2000) went from 32 to 52 points this season for a team in the RBC Cup. The 6-foot-2, 187-pounder is the No. 40-rated North American skater by NHL Central Scouting heading into June’s NHL Draft. Zak Galambos, Wenatchee (BCHL) – A rival coach called him one of the best defensemen in the BCHL playoffs, and nearly all of his 28 points came in 2018. An elite defender, the ’97 and Minnesota State commit excels on the penalty kill and does plenty of damage with one-timers on the power play. Kyle Mayhew, Fairbanks (NAHL) – Another Denver recruit, Mayhew paced the Ice Dogs’ defense on its run to the Robertson Cup semifinals. An excellent skater, he had 39 points through 58 games and was a plus-20. Jacob Modry, Wenatchee (BCHL) – A ’99, his size (6-foot-3, 190) and steady play in the ‘D’ zone is what allows all of his offensively gifted blueline buddies the freedom to jump into the play at will. 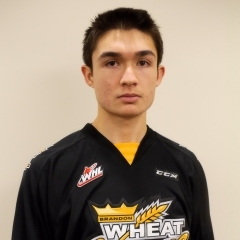 Chad Sasaki, Wenatchee (BCHL) – Don’t let his 5-foot-7 frame fool you, the Colorado College commit was one of the main drivers of the Wild’s potent offense off the rush. A ’98, his 46 points through 77 games nearly quadrupled his output from a year ago and he excelled on the power play. St. Ivany erupted for 39 points one season after having 10. The 1999 and Yale commit is rated the No. 119 North American skater by NHL Central Scouting. 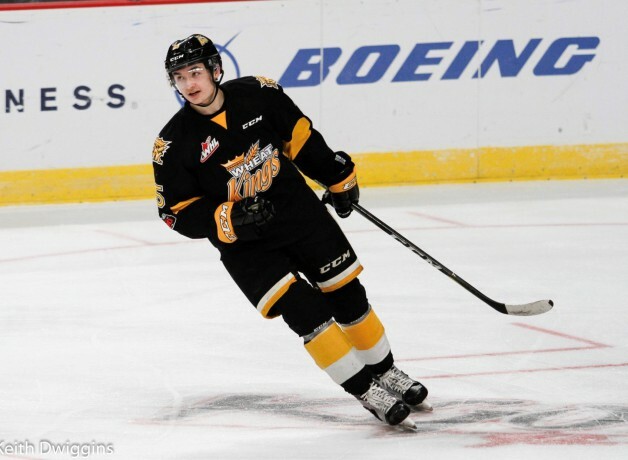 Keoni Texeira, Portland (WHL) – Expect the ’97 to be in plenty of demand as a free agent after capping his junior career with 33 points and nine goals while captaining one of the Western Hockey League’s top franchises. Cam York, U.S. NTDP U-17 (USHL) – The 2001, a player to watch for the 2019 Draft, put up 38 points and helped the NTDP’s U-17s make the USHL playoffs for the first time. Sasha Chmelevski, Ottawa (OHL) – The 1999 had 76 points, including 35 goals and five game-winners for the 67s. Last season’s OHL Scholastic Player of the Year, Chmelevski signed with the San Jose Sharks, who picked him in the sixth round (185th overall) in 2017, in April and played a total of 10 games for their AHL affiliate. Patrick Choi, Syracuse (USPHL NCDC) – A USHL Phase II pick of Omaha, the ’98 had 56 points, including 24 goals in 50 games. Vincent de Mey, Muskegon (USHL) – The Northern Michigan commit, a ’97, joined the Lumberjacks early in the season via a trade and put up 38 points, including 21 goals. Andre Ghantous, Trail (BCHL) – The ’98, a skilled playmaker, finished with the same amount of points he had last season (44), but he exploded for 14 more in 15 playoff games and finished with 24 total goals. Omaha took note and drafted him in the USHL’s Phase II draft. Rory Herrman, Green Bay (USHL) – Year 2 in the USHL was much kinder to the ’99 as he went from three points to 25 (including 12 goals) and gained a regular spot in the lineup for the Gamblers. Ivan Lodnia, Erie (OHL) – A 2017 Minnesota Wild draft pick (third round, 85th overall), Lodnia had exactly the same number of points 59 that he had the season before, albeit in 26 fewer games. The ’99 played six games in the AHL at the end of the season. Jake McGrew, Spokane (WHL) – After having his first junior season wiped out by a preseason knee injury, the ’99 bounced back for 44 points (21 goals) in 72 games. He was a sixth-round pick by San Jose (159th overall) last June. Jason Robertson, Kingston (OHL) – His 87 points and 41 goals led the Frontenacs, and then he tacked on 18 points in 16 playoff games. He also had eight game-winning goals. A second-round pick of the Dallas Stars in 2017 (39th overall), the 1999 signed with them in early May. Evan Somoza, Odessa (NAHL) – The ’97, a Utica College commit, finished his junior career with 48 points, more than double his previous high at this level. Murphy Stratton, Wenatchee (BCHL) – The ’99 came from the WHL and was a much bigger factor for the Wild, piling up 60 points (including 17 goals) through 72 games. He plays in every situation. Brayden Watts, Vancouver (WHL) – The ’99 from Bakersfield nearly tripled his previous best WHL season with 40 points (17 goals). Matt Wiesner, Northeast (NAHL) – A ’97 who finished his junior career with far and away his best totals for season – 41 points and 21 goals. He’s headed to Babson College. Note: This team was compiled in consultation with several junior coaches.